Dynasty star Joan Collins has secretly married her boyfriend Peter Holm in Las Vegas. In a 1 a.m. ceremony that was attended by only four friends, the 52-year-old actress wore a cream silk crepe dress and carried a bouquet of roses and lillies. Peter, 38, wearing a white tuxedo, slipped a half-inch wide solid diamond wedding ring on his bride's finger. And Joan gave him a gold ring in return. British-born Joan also kept up the tradition of "something old, something new, something borrowed and something blue." She wore a pearl and ruby bracelet that belonged to her mother, her dress was new, and she borrowed a lace handkerchief and had a blue garter on. It was the fourth marriage of the star who earns £1 million a year playing bitchy Alexis. But afterwards she said: "This time its for keeps. We are very much in love." Now Joan plans to introduce her new husband to Prince Charles and Princess Diana at a ball in Palm Beach, Florida, next week as part of their honeymoon. The wedding was planned like a military operation in order to keep it secret. At 3 p.m. on Wednesday Joan's friends, Judy Bryer, 46, and her film producer husband Max, 49, got a phone call in Los Angeles, saying: "Pack a bag and be ready to fly." Joan then rang a photographer friend and gave him the same message. The three arrived at Los Angeles airport where Joan, Peter and a Swedish friend of Peter's who was the best man were waiting. A private jet flew the party to Las Vegas and they were taken to the Little White Chapel on the gaudy Las Vegas strip in a white Rolls-Roye. Even the minister did not know the identity of the bride until she arrived. After the 10-minute ceremony - which cost only £20.00 - the couple flew back to Los Angeles, getting home at 4 a.m. Even Joan's sister, Jackie Collins was not told of the wedding until the morning. Joan's 14 year old daughter, from a previous marriage was told of the plan but stayed at home. "Joan didn't think it fair to keep her daughter up all night when she had school in the morning," said an aide. But insiders suggested the long-standing strain between Katy and Holm might be part of the reason for her absence. The actress is back to work on the Dynasty set today and in the evening she and Peter will hold a celebration dinner with friends. The all-star cast of Dynasty was stunned when they learned of the marriage. 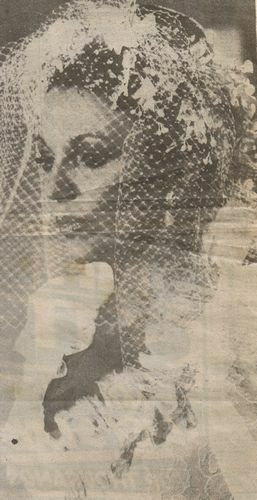 One source said : "Joan's wedding is the subject on everybody's lips today. Not a soul knew about it."